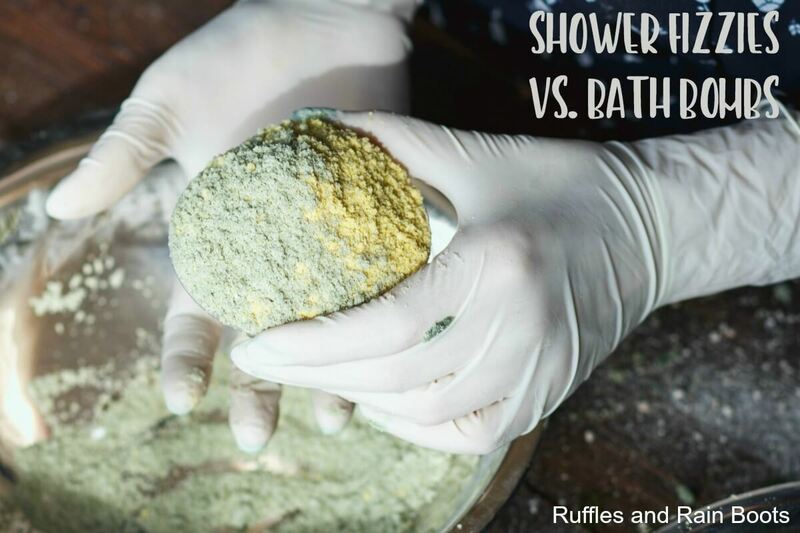 I’m often asked, “what is the difference between shower fizzies versus bath bombs?” Shower fizzies, shower bombs, and shower steamers are all the same thing. Shower fizzies and bath bombs, however, are NOT the same. How are Shower Fizzies and Bath Bombs Different? Here at Ruffles and Rain Boots, we love sharing our DIY Bath Product Recipes. We get asked a lot about the difference between shower fizzies and bath bombs. Ultimately, the use of the item determines how both shower fizzies and bath bombs are made. 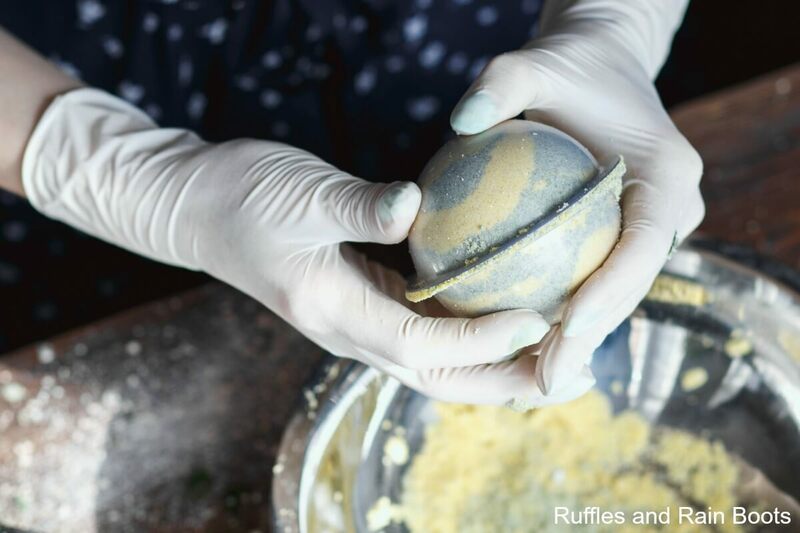 Bath bombs are often round and let’s be real: you don’t want a shower fizzy to be round. It becomes a shower hazard if it is rolling around while you’re taking a shower! Shower fizzies are ideally flat (or flat-ish) on one side to prevent movement. Although some people put the shower fizzy directly under them while they shower, it’s recommended that they are placed on a ledge or even over the drain. With bath bombs, the intended use is to have the mixture interact with the skin directly. Shower bombs, however, the intent is more as a shower steamer – it is designed to release the oils into the air. Shower fizzies have a higher concentration of essential oils because you CAN increase the aroma (and therapeutic benefits of that aroma) without damaging skin. The benefits of a shower fizzy are more focused on aromatherapy. Shower fizzies don’t need to contain large quantities of moisturizing oils like bath bombs do. In fact, you only want enough oil in a shower fizzy to hold it all together. Bath bombs, however, can use a higher amount of oil because it’s interacting with the skin. We often include moisturizing oils in bath bombs to have a restorative benefit. The mixes for the shower fizzies and bath bombs can start off the same (sodium bicarbonate + citric acid), however, the levels of additions vary. To be honest, you don’t even really need citric acid in shower steamer recipes! What Type of Mold Is Best for Shower Fizzies Versus Bath Bombs? most silicone molds used for mini cakes, donuts, etc. Bath bombs, although most of the time they are spheres, don’t have to be. We mold bath bombs in everything listed above and more! You have a lot of options when molding both shower fizzies and bath bombs. It’s my preference to make the shower fizzies smaller than I make bath bombs. What Is a Good Shower Steamers Recipe? Ultimately, you want the mix to be packed well, otherwise the shower fizzy will fizzle out too quickly for the aromatherapy benefits to kick in. There are two schools of thought with shower steamer recipes – use citric acid for maximum carbon dioxide release or don’t and save money. How Do I Make Shower Fizzies with Citric Acid? Mix the baking soda and citric acid in a glass or stainless-steel bowl. Wear gloves if mixing by hand. Once everything is mixed, spray the witch hazel (between 5-10 sprays). If you’re in a humid environment, start with one spray and incorporate fully before adding more. The mixture is ready when you can press it together and it keeps its shape. Press the mixture in your mold and pack well. It doesn’t have to be perfectly flat, however, you do want to make sure the base is evened off. Leave the molds to rest (2 hours at a minimum or even overnight). Pop out the shower fizzies and let them dry overnight. Store them in an airtight container. We like to seal ours in small cello bags, Saran Wrap them and place them in a zip-top bag, or store them together in an airtight apothecary jar. How Do I Make Shower Steamers Without Citric Acid? These are super-duper easy to make! Mix the water and baking soda, add the essential oils, and pack the mix tightly into a silicone mold. Let rest for at least 1 hour (overnight is best). You can bake the recipe, too (350 degrees F for 20-minutes), but I don’t believe it’s necessary unless you live in a very humid environment. What Are the Best Scents for Shower Fizzies? Well now, that’s 100% personal preference. I like to think of the benefit I’ll get from the aroma – after all, that’s exactly what shower steamers are for. If you’re a morning shower type, try uplifting, bright scents. Some are citrus, peppermint, and eucalyptus. For those who like to take shower in the evening, try calming, soothing scents. Some of my favorites are lavender, frankincense, and anything mixed with vanilla. Ultimately, the scent combinations for shower steamers are as unlimited as those for bath bombs. You can even use a bit more of them in the mix! 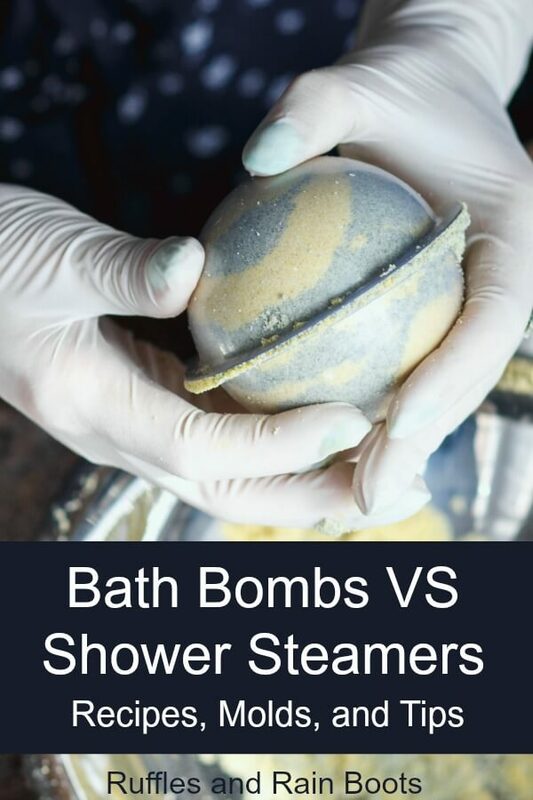 How Do I Use a Shower Steamer Versus a Bath Bomb? To use the bath bomb, drop it in a tub filled with warm water. The reaction is immediate – the baking soda and citric acid release carbon dioxide. That’s the amazing fizzy action of a bath bomb. When this reaction takes place, the bath bomb breaks down, releasing the aroma and any beneficial oils or salts. How Do I Use Shower Fizzies (Shower Steamers)? When you place the fizzy in your shower, take note: most people will try to put the shower bomb directly under them. Don’t. Instead of keeping it directly under you, place it over the drain, at the back of the shower (farthest from the drain), or on a ledge or shelf. I place them on the drain or on the inside edge of the tub. Do you have any questions about shower fizzies versus bath bombs? Ask them below and I’ll answer anything I can! It’s fun to play around with the mixes to see which work best for each setting. 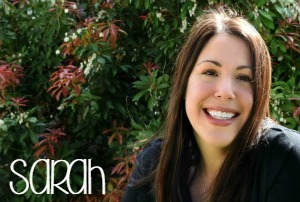 Hi, how do I prolong the scents of my essential oils? I made a few shower steamers to sell, and my essential oils evaporate? I’m sure you know this, but for others who might be selling, I’ll start at the beginning: all DIY bath ingredients have a shelf life and that shelf life is only as long as it’s shortest ingredient’s shelf life. If hazelnut oil is 3 months, then the bath bomb’s shelf life is 3 months. 1. store them in an airtight container – moisture is the enemy. 2. use a dehumidifier in the storage space – humidity can greatly affect DIY bath products. You do not mention using the clay for the shower fizzies. Is there some reason not to use it? Thanks for asking! 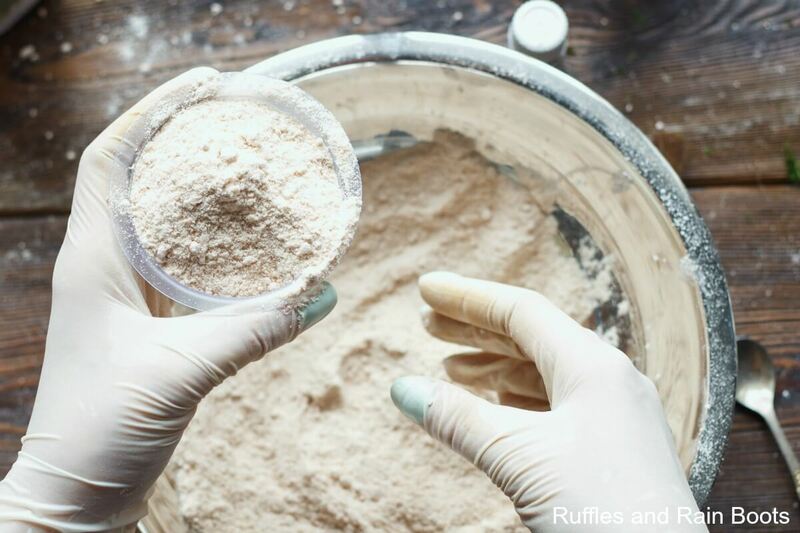 The benefits of clay are for the skin so they can be used in bath bomb recipes and left out from shower fizzies. I use both French green clay and white bentonite clay powders in bath bombs. They do dry the recipe out a bit, however, so if you’re adding them be sure to adjust the recipe to add slightly more moisture. I’m not sure I have any bath bombs with clay on the site so I’ll try and look through my pending recipes to share and get one out.